May 25, 2016, 10:04 AM · Having the right pianist for your performance, whether its a solo recital, studio recital, audition or other event, can make all the difference in the world. A good pianist will be supportive, sensitive to your musical impulses and able to inspire a few new ideas as well. When you find this kind of pianist to collaborate with you or your students, treat him or her like gold! Treat your pianist like a collaborator and not a hired hand. Sure, you are probably hiring a pianist, but this is not like buying a CD or paying for your dishwasher to be repaired. You are paying for their time and expertise, and then you will work together to make something of it. The world has even changed to reflect this distinction: "My major was in Piano Accompanying, now they call it Keyboard Collaborative Arts," said my friend Jeanina Quezada, a collaborative pianist (and once my kids' Music Together teacher). "If anything, they are finally taking it more seriously, just by the name change." Pianists of an earlier generation had to tolerate a lot of disrespect, frankly. Quezada's teacher told of the days when singers "would put the pianist behind a palm tree, on stage!" I'd like to think we string players would never have done such a thing. But make sure you are not inadvertently making your pianist invisible or taking his or her work for granted, that instead you are acknowledging and appreciating them. Some pianists are so good and know the repertoire so well, they could probably walk in and read the whole thing, especially in the case of a young student recital. But for everyone's sake, don't do this. Pay your pianist for his or her time, and schedule a rehearsal about a week in advance. When it comes to beginning and intermediate students, "a lot of times, the kids are thrown by suddenly having to play with a pianist," Quezada said. Even if they have been playing along to a recording of the accompaniment, it's going to be different with a live pianist. It's in the students' best interested to have a rehearsal. Make sure you, or your students, know the music well before the rehearsal. Sometimes pianists end up almost having to coach students because they have a hard time putting things together. Try to tell your pianist in advance if that kind of work will be required. Also, be punctual, don't keep your accompanist waiting. Have readable music, in good order. If there are difficult pieces, offer to give the pianist the music in advance and certainly allow the pianist to take the music home. Remember that the piano part can be quite difficult, even in early Suzuki books. If you are giving the pianist copies on computer paper, ask if they want it taped, or if they prefer to order it themselves. Ideally, have it in a three-ring binder, hole-punched, or taped in a way to facilitate easy page turns. When it comes to programs with lots of different students, be organized. Don't wait to make the program until the morning of the recital, create it in advance of the first recital and print it out for the rehearsal. When I'm doing a program with a lot of pieces from Suzuki Books, I write in the margins of the program, which books are needed for each piece. This seems obvious, but it's the kind of thing that people sometimes overlook. Be sure to spell his or her name correctly! Double-check if you need to. If it's a solo recital, make sure you direct the audience to applaud for the pianist after every piece. 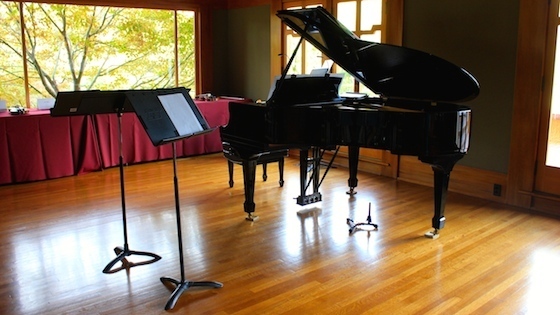 If it's a student recital, the teacher should stand up at the end and acknowledge the pianst, "Let's have a round of applause for our wonderful pianist..." In either case, "You always, 100 percent of the time, acknowledge the pianist before you walk off the stage," Quezada said. "And you give the pianist the chance to bow and get their own applause." Talk about how much you will pay your pianist in advance, and be professional about requesting fees and reacting to them. Sometimes college students balk at the idea that they have to pay for their accompanist, as perhaps they have never footed the bill in the past. If you are a college professor, consider discussing this with students as part of their recital preparation: that a high-quality professional accompanist will need to be paid adequately. Know that it will probably cost extra if you are hiring someone to fill in at the last minute. Have the check ready at the performance. I prefer to enclose the check in a thank-you note and place it on the piano with the music before the performance. Whether in a note or out loud, remember to say, "Thank you!" May 26, 2016 at 12:02 AM · I absolutely agree, I have worked with a pianist who could bring out what I didn't know I had! May 26, 2016 at 03:38 PM · I had the great fortune to work with a wonderful pianist over a period of years, on things like the Brahms Sonatas, Franck, etc. It was so eye-opening. May 28, 2016 at 02:57 PM · Also, buy your pianist a gift whether flowers or a nice keepsake or something of the like. Even if you're paying him or her to play with you, a nice bouquet goes a long way to show appreciation. Anyone who has ever lost a good accompanist (I did, to another job far away) will understand what a treat it is to have a strong partner. May 28, 2016 at 06:07 PM · Good idea, Chuck!